Shaft support products for linear applications are available as stand alone blocks or as rails. 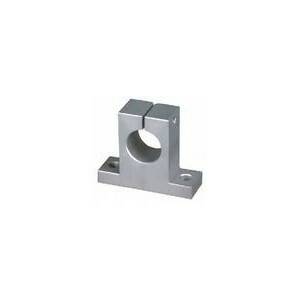 Shaft support blocks provide a means of supporting shafts. The support blocks are primarily intended for applications where loading is somewhat light and resulting deflection between supports does not become an issue. In linear motion systems with closed linear sets the guiding shafts are mounted at their ends. Precision shaft support blocks have been developed for these applications. Shaft support blocks are typically made out of aluminum or ductile iron, however for higher loads steel is available. Shaft support rails are designed to support the shafts on which open-type linear bushings run to prevent them from bending under load. Shaft support rails are available in ready-to-mount sections noted for accuracy and rigidity. Shaft support rails prevent deflection and increase efficiency and are available plain or pre-drilled in both inch and metric sizes.